The HP Spectre x360 isn’t a single laptop: that would be too simple. Instead, the range covers both 13.3in and 15.6in chassis sizes, with seven different specifications to choose from on HP’s website. What both chassis share is the same design aesthetic, so while I focus on the larger Spectre X360 here it doesn’t take a huge leap of imagination to apply much of my criticisms – and compliments – to its 13.3in sibling. 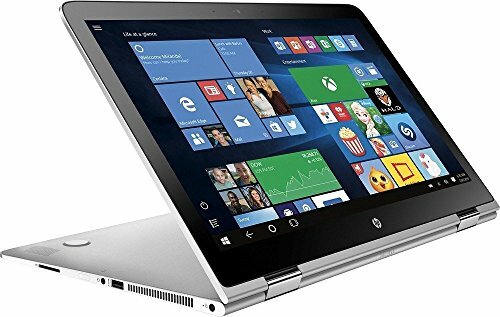 To be precise, HP sent us the Spectre x360 15-bl000na for testing: a 15.6in laptop with a 4K display, Intel Core i7-7500U processor, 512GB SSD, Nvidia GeForce 940MX graphics. I hunted around for laptops with a similar specification, but nothing quite matches up: there’s the Lenovo Yoga 910, but that doesn’t come with discrete graphics. Or you could buy an equally powerful Dell XPS 15, but this is a regular laptop without the Spectre’s convertible abilities. As such, the Spectre 15 currently operates in its own personal niche. Powerful core So what do you get for your money in the Spectre x360? Pride of place goes to the 2.7GHz dual-core Kaby Lake Intel Core i7-7500U processor, which sits just off the top of Intel’s “U Series” of processors. With two cores, and Intel’s Hyper-Threading offering a total of four threads for applications to use, the Spectre x360 flies through everyday tasks. It scored a highly respectable 50 overall in our benchmarks. A multitasking score of 31 reflects, in part, the 8GB of RAM; if you love the Spectre 15’s design but want a little more capability for running multiple tasks, you could choose the 15-bl001na – this doubles the RAM to 16GB and the SSD size to 1GB. Keeping price in mind, 8GB of RAM coupled with the blazing-fast 512GB PCIe SSD here probably makes more sense for most people. These Samsung SSDs are blisteringly fast, tested on the AS SSD benchmark with 1,919MB/ sec sequential read and 1,504MB/sec sequential write speeds. If you’re after a more powerful system still, you’ll need to sacrifice the 2-in-1 convertible design and choose a laptop such as the Gigabyte Aero 15 instead. Powered by a quad-core Core i7-7700HQ chip, the Aero 15 rocketed to 128 in the same benchmarks. Given the inclusion of the Kaby Lake processor, I was disappointed that HP opted for an older generation Nvidia graphics chip. The GeForce 940MX GPU, with 2GB VRAM, provides enough power to play most games at Full HD, but the newer GTX 1060 would have been a better choice for this laptop’s 4K display. For instance, I could play Dirt Showdown with medium settings at an average frame rate of 38fps, which is acceptable but a long way from being completely smooth. It also struggled running the graphically intense Metro: Last Light at Full HD, achieving an average frame rate of 34fps in our benchmarks with medium settings and SSAO disabled. If you’re after an all-out gaming laptop, the Gigabyte Aero 15 is again a superior choice. 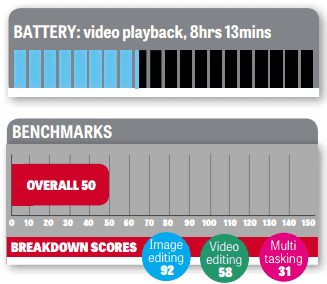 For its size, I wasn’t expecting miraculous battery life, but the x360 still survived for 8hrs 13mins in our video-rundown tests – an excellent result for a laptop with a screen this large. For context, the lower-power Dell XPS 13 2-in-1 lasted a shade under eight hours, despite its smaller screen. Twist and shout The HP Spectre x360 is designed to perfection. It’s a 2-in-1 convertible laptop, so the screen folds over rather than detaches, and it’s lovely to look at. Copper accents glint out from the x360’s “Dark Ash Silver” body, which is built entirely from aluminium. Such design touches can’t disguise the fact this is a big laptop, with no minimalist border on its screen to match the Aero 15, for example. HP provides a low-profile bezel on either side of the display, but even this can’t mask the distracting size of the bottom bezel. Measuring 356 x 251 x 17.9mm and weighing 2kg, it has all the heft of a traditional 15.6in laptop. A little compensation comes in the form of a faux-leather carrying case in the box – a nice and unusual touch. There are two USB-C ports on the right side of the laptop, one of which can be used to transfer data and connect an external monitor, while the other also supports HP’s Sleep and Charge (which, as its name suggests, allows you to power other devices while your laptop is asleep or hibernating). Handily, there’s also a full-size HDMI port and volume rocker. Head to the left of the laptop and you’ll find a regular USB 3.1 port along with a multi-format SD card reader, a headphone/mic combo jack and the illuminated power button. 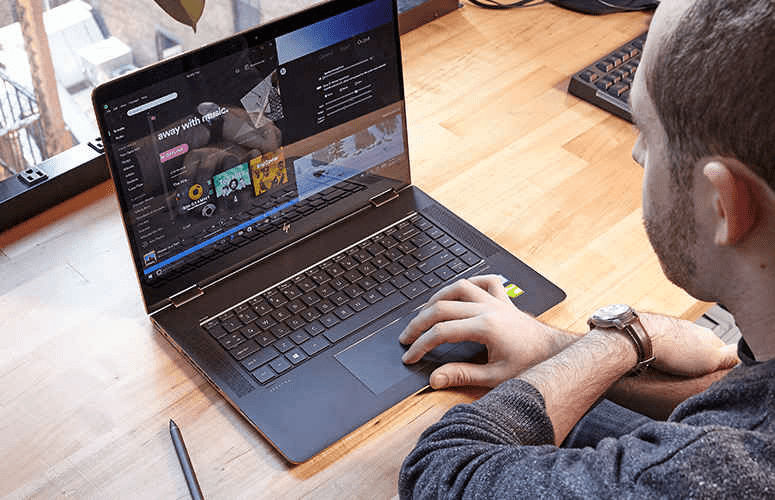 For wireless connectivity, HP chooses Bluetooth 4.2 and an Intel 802.11ac 2×2 Wi-Fi antenna – which isn’t quite the 3×3 antenna you need to take advantage of the latest routers (see p74), but it’s fast enough. Audio is delivered by dual upward-firing Bang & Olufsen speakers situated either side of the keyboard; these can be fine-tuned through the Bang & Olufsen Audio Control desktop app. I found sound quality perfectly acceptable for a laptop of this size and, when used as a tablet, the speakers resonate effectively under the screen. If you want deep bass response or a fantastic treble extension, you’ll need an external Bluetooth speaker. There’s also a Full HD 88-degree wide-angle webcam above the screen, equipped with dual microphones for making video calls. 4K display The Spectre x360’s screen is a 4K (3,840 x 2,160) IPS unit with multitouch input and stylus support, and when used in tablet mode the display responds well to touch input. The panel itself is good but not outstanding. Colour rendition is middling, with 85.4% sRGB gamut coverage. It isn’t the most color accurate of screens, with an average Delta E of 2.76 (lower is better), but with brightness reaching a peak of 345cd/m² in our tests you shouldn’t have any trouble using it outdoors. In terms of daily comfort, the second and third most important components of a laptop – after its screen – are surely the keyboard and touchpad. Happily, they’re both a pleasure to use. The touchpad is great because it’s so large, giving you ample space to perform Windows 10’s expansive multitouch gestures. I found it responsive and capable of responding to pinch and zoom actions flawlessly. The HP’s backlit keyboard is another plus point. Each key has a weighty feel, with positive feedback, and this makes the Spectre x360 a fantastic laptop to type on. If you wish to save battery, you can dim or disable the keyboard’s backlight. It’s also good to see HP including a stylus, especially when rivals such as Microsoft make this an optional extra. 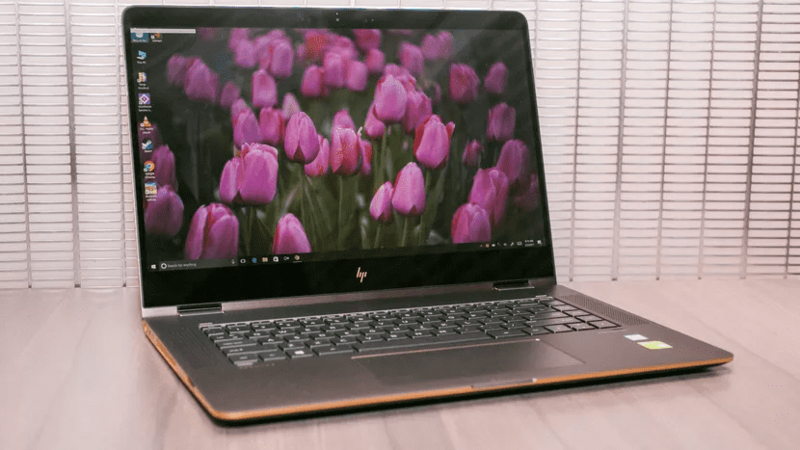 HP’s offering works flawlessly with Windows 10, and the laptop’s palm rejection works effectively as well, disabling capacitive touch input as soon as the tip of the stylus gets close to the screen. X marks the spot The HP Spectre x360 is a top-quality machine. As a laptop you’ll love the power on offer, the large, highresolution display and its flawless keyboard and touchpad. It also offers all the tablet features you need – provided you don’t mind its bulk – with a multitouch display that works brilliantly and a handy stylus. 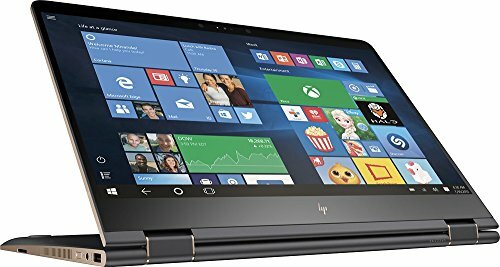 It isn’t the most powerful of gaming machines, but otherwise there’s nothing to dislike about the HP Spectre x360. If you’re looking for a do-it-all convertible, this is well spent.